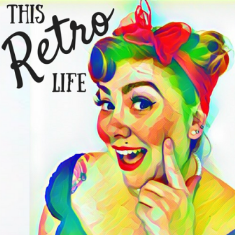 I was so thrilled to receive her email and couldn’t wait to feature her on This Retro Life. Laila moved to Australia from Pakistan in 2003 and it was living in an historic country like Pakistan and then hitting the op shops by necessity in Australia that started her vintage journey. For Laila and her family moving to Australia came at a good home as tensions increased in her home land but it wasn’t always easy to settle into a Western country. But pinup and vintage helped. And thanks to dance classes at The Mustang Bar Laila started to find not only her dancing feet but also her community! And like so many things Perth has a vibrant Rockabilly community. Full of great rockabilly bands, beautiful pinups, burlesque dancers and so much more. She then found her partner and a modern mid century romance formed and like so many of us as she fell deeper into the vintage rabbit hole her style and confidence developed and changed. Laila then also found herself involved in a global pinup movement. After sharing a photo with the founder of Pinups of Colour she then became and admin of the page and now helps spread the message of diversity in the pinup community around the world. Laila said this platform and the rise of social media in the modern vintage world has created such a great place for women from around the world to share their love of vintage. But also to be able to launch their modelling careers, share their small businesses and support each other no matter their background. I can’t even begin to say what a pleasure it was to spend an evening chatting to Laila. You have got to follow her on instagram and of course hear more about her retro life in episode twelve of the podcast!